A friend sent me a group of pictures from WW2 that included many I have not seen, or if I did, forgot I saw them. Whatever the case, many are interesting like this one. It captures the moment a P-47 Thunderbolt has fired its rockets. By 1944 and the Normandy Invasion the P-47 Thunderbolt (the Jug) was duo role, serving as a fighter and a fighter-bomber. But seeing as the Luftwaffe could hardly contest the skies over France the P-47 was often regulated to a ground attack role as you can see from the picture. Rockets being fired from a P-47, date and place unknown. It appears that the target for the P-47’s rockets is railroad bridge although I am not certain. It’s interesting to note how close the airplane seems to be to the target. I do know it was common for the fighter-bombers (the Germans called them “Jabos) to target bridges, especially railroad types since the successful destruction of these structures would result in supply and reinforcement problems for the enemy. During the Normandy Campaign the Allies had uncontested air superiority and their fighter-bombers made it nearly impossible for the Germans to move men and tanks by day. 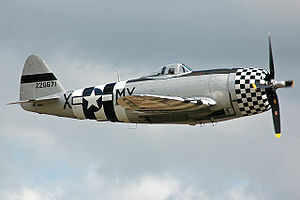 The famous P-47 Thunderbolt played a large part. It’s an interesting picture given the photographic limitations of the time. 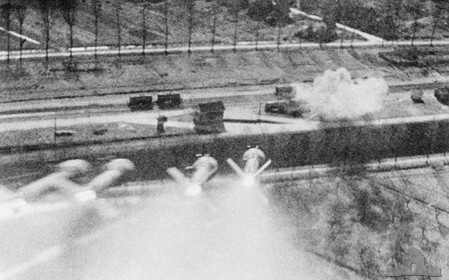 The photo of the rocket attack on the train was actually taken from the fun camera on a Hawker Typhoon attacking targets around Normandy in preparation for D day, and after D day. The rockets are the standard British type employed by Typhoons, which can be seen by the bomb mounted on the end of the solid rocket booster, whereas the american rockets had a warhead that was flush with the solid fuel. The P-47 and the Typhoon did much the same fighter- bomber role, but the typhoons were more adept and were used in Europe, leaving the Jugs to ddeploy bombs, rockets, and napalm mostly in the Pacific. Interesting how captions can be wrong. Thanks for the clarification and taking the time to write.